It’s that time of year again when the political landscape begins to take over. 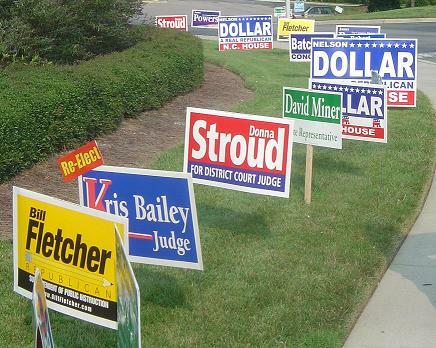 With political yard signs covering the landscape it’s easy to get your message lost in the mix. Regardless of who you want to win the political election when creating political yard signs and banners you want to make sure that the message about your favorite candidate can easily be seen. Here are some useful tips when putting together political yard signs and political banners in the Riverside, CA. area. It’s no secret that the majority of people that go to the ballot box in the Riverside, CA. area do not vote on a candidate based on their credentials, but rather the popularity. The concept of “Sight Sign Association” plays heavily into this mindset as if the voter does not know any of the candidate’s platform, they’ll simply vote for the one that they recognize the most. It is for this reason that we recommend a larger quantity of political yard signs and banners rather than trying to have a political yard sign or banner that explains the position of the candidate. 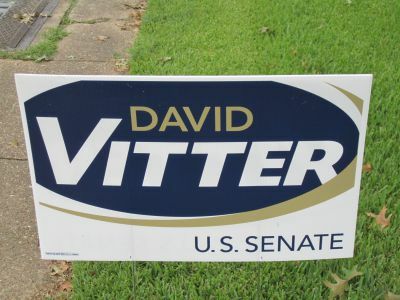 We have seen many political yard signs and banners that essentially want to give the 10 or more points that the candidate is running their political platform on; however, when you try to put that much information on an 18” x 24” yard sign… No one can read it when driving down the road making it useless. So at Precision Sign and Graphics serving the Riverside, CA. area, we recommend to put the name of the candidate with some attention grabbing or traditional political colors on the political yard sign or banner, then put them out in mass quantities. When utilizing political yard signs and banners that are not on the road but rather in a parking lot or on a walking path, you can easily get away with putting additional information on these products; but don’t go crazy with it. Not many folks are going to stop and read a paragraph of information on a political yard sign. We also recommend to have a very short and simple website address that is easy to remember to go on your political yard sign, banners and materials so the voter can go to that candidate’s website to get more information. At Precision Sign and Graphics serving the Riverside, CA. 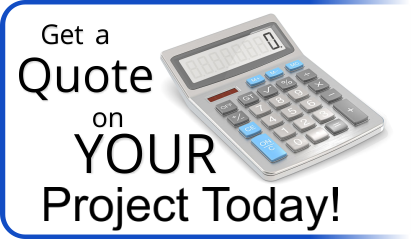 area we can design and print political yard signs and banners that will help get your message out. With discounts for high quality, high volume materials you can be sure to get your political message out loud and clear. We can also help with political vehicle wraps for your car, bus or van as well as logo design and business cards. We are your full service political sign and graphics headquarters.